Volkswagen’s ID. range of models is growing, with the latest, the ID. Roomzz making its debut ahead of Auto Shanghai 2019. The Level 4 autonomous-capable, fully-electric SUV is powered by a pair of motors for a total system output of 306 PS – similar to that of the ID. Crozz – drawing from a 82 kWh battery pack for a range of 450 km according to WLTP measurements. 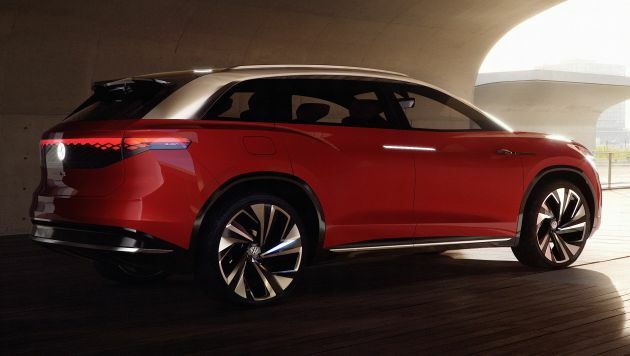 The concept SUV can be charged up to 80% of its battery capacity in half an hour via a 150 kW DC source. Thus equipped, the ID. Roomzz attains 100 km/h from a standstill in 6.6 seconds and an electronically-limited top speed of 180 km/h. The fully electric SUV can be operated in Level 4 autonomous driving via its ID. Pilot mode, which also enables occupants to rotate the SUV’s individual seats inwards by 25 degrees for a ‘more communicative, lounge-like atmosphere’ aboard the ID. Roomzz. The fully automated drive mode also allows the driver to enable the ID. Pilot Relax mode, where passengers can tailor the position of the seats to suit, including a fully reclined position. Each passenger gets to adjust their seat individually to suit their preferences, with adjustments ranging from fully upright to a reclined position. Meanwhile for the driver, there isn’t a conventional dashboard as such, rather a ‘digital cockpit’ consisting of a full-glass panel that is also comprised of a digitalised steering wheel for driver-centric information. This steering wheel features touchscreen sections for power transmission functions, as well as a 5.8-inch display for information such as navigation instructions whilst in autonomous mode. An augmented reality (AR) head-up displays the vehicle’s speed and relevant warning signs, projected as pictograms within the driver’s field of view, such as for on-road directions. The ID. Light interactive visual strip beneath the windscreen offers additional informations such as the currently-active drive mode (ID. Drive or ID. Pilot), as well as information about the assistance systems, navigation and the new CleanAir system. The interior of the ID. Roomzz employs the use of upholstery material dubbed AppleSkin, which consists of a renewable raw material. Produced by fabrics manufacturer Nuuwai, AppleSkin consists of 50% leftovers from apple products which are dried and ground to a very fine apple powder, and mixed with 50% polyurethane before heat treatment. It is currently possible to replace 20% of polyurethane used exclusively up until now with apple leftovers using a process that was developed in-house, says Volkswagen. Occupant cabin innovations continue with ID. Light, which integrates the display of information to the car’s occupants through various surfaces along the cabin. These include the front of the windscreen, upper segments of the interior door panels which feature an illuminated, laser-etched wood finish pattern, the outer areas alongside the panoramic glass roof over each seat, as well as on the ID. Light roof console. The individual lighting scenarios offered by ID. Light can be paired with various driving and seating modes, the latter can be specified via touch fields located along the outer front sections of the seating areas. This also houses the touch fields for opening and closing the door and windows on the ID. Roomzz. Certain elements in the cabin, such as seat linings, are painted in white gold to complement the shapes and graphics in the interior space, where microfibre is used for the headliner and roof pillars. The light-absorbing qualities of microfibre lend itself well to application in the ID. Roomzz cabin, in order for the light effects to be focused as much as possible upon the decorative areas along the doors, as well as on for the digital cockpit, says Volkswagen. When the ID. Roomzz goes to market in fully productionised form, it will do so with a seven-seat configuration, says Volkswagen. 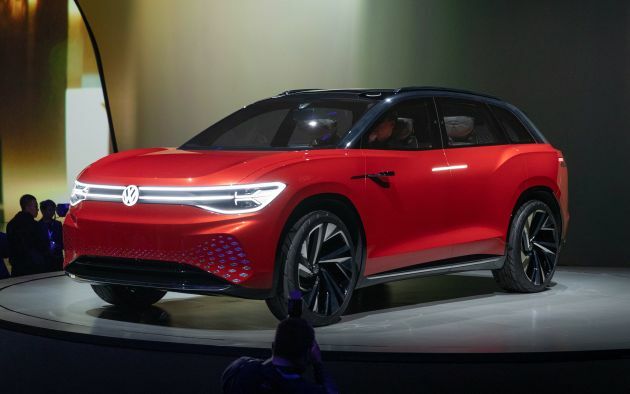 It remains to be seen how much of the concept model will make it into production reality, but for now, do you like what you see of the fully electric SUV? Open roads and closed circuits hold great allure for Mick Chan. Driving heaven to him is exercising a playful chassis on twisty paths; prizes ergonomics and involvement over gadgetry. Spent three years at a motoring newspaper and short stint with a magazine prior to joining this website. Are you sure this one is VW because there are lot of resemblance with Perodua X-Concept lor..Even the suicide door the same. So the entire face is the DRL? That would annoy the hell out of most people in front. Next Post: AD: Euromobil announces special service campaign for grey import Audi owners – full benefits included!